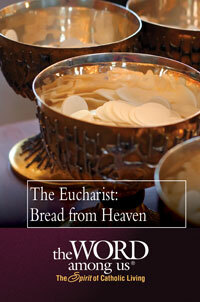 This pamphlet contains three essays that explore an array of images that reflect the Eucharist's richness. Each image reveals and highlights yet another of the brilliant facets of this profound sacrament. The first one reflects on images in the Old Testament. The second on reflects on Jesus presence in the Eucharist and his transforming power, and the last essay focuses on the depth of God's love for us. Because the Eucharist is spiritual food, we encourage you to meditate on these essays.